Yellow is one of the most common colours found in diamonds, with white diamonds of a colour grade of J and lower exhibiting yellow tones. However, vivid yellow diamonds, known as Fancy Yellow or Canary Yellow Diamonds, are diamonds with a strong yellow colour that ranges in intensity. These fancy diamonds are mined in parts of South America, South Africa and Australia. Some of the world’s most famous diamonds are yellow diamonds, including the Tiffany Yellow Diamond, which was mined in South Africa’s Kimberley Mine. Originally weighing 287.00 carats, it was cut to a polished cushion cut diamond of 128.54 carats by commission of Charles Tiffany in 1877. Fancy yellow diamonds are graded on a different colour scale to white diamonds, which is based on the intensity of colour visible in each diamond. This colour scale has five distinct colours, from the palest — yellow (Y), fancy light yellow (FVY), fancy yellow (FY), fancy intense yellow (FIY) and fancy vivid yellow (FVY). Natural fancy yellow diamonds are quite rare and quite expensive due to their relative rarity. However, it is possible to purchase yellow coloured diamonds that have been treated to appear yellow, through treatments such as irradiation and High Pressure High Temperature treatment, at a much more affordable price. Keep in mind that jewellers are ethically bound to declare whether a diamond has undergone any treatments to enhance colour or clarity, and if a natural yellow diamond does not come with a certificate from a reputable diamond certification laboratory declaring that it is a natural yellow diamond it may not be what it appears. 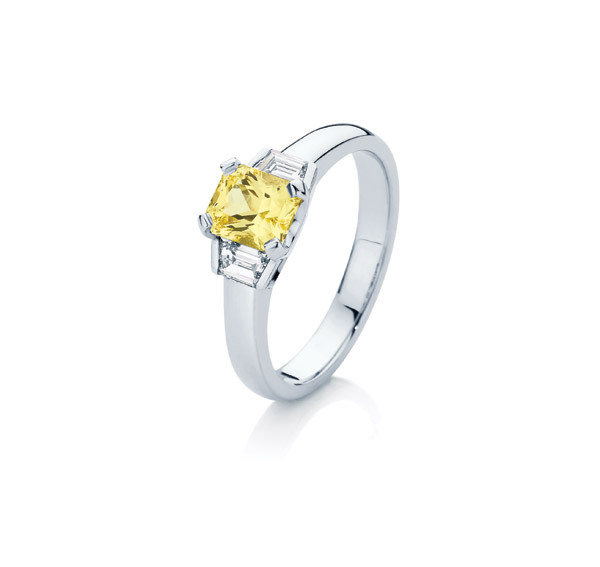 Fancy yellow diamonds are a beautiful option for any type of diamond jewellery, and can be paired with diamonds of other colours, including white diamonds, to create exciting jewellery.